Where’s Wallis? 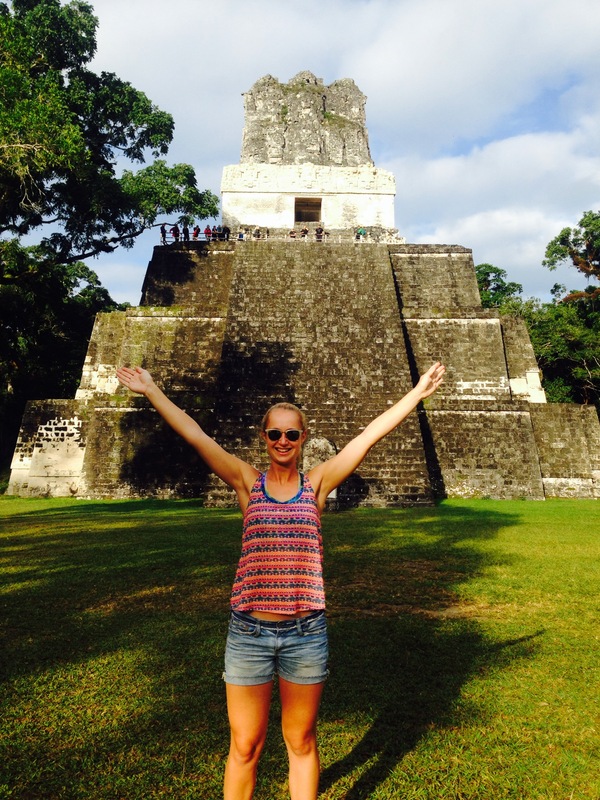 Tikal, Guatemala – Where's Wallis? The 10 hour bus up north to Flores was surprisingly bearable. We had a good little group in the van: myself (a great start…), LeAaron and Ana, Lav and Jenny, and Gerry. LeAaron was originally from NYC and Ana from Mexico where they currently live but are moving to LA after Christmas. Lav and Jenny are both doctors from London out for three weeks of travels around Central America and Gerry is from Belgium. Despite the journey being one of the best so far, when we arrived in Flores I was in a bit of a rotten mood. It wasn’t helped by the fact that once we were a mere 5 minutes from Flores, in the town of Santa Elena, it was deemed necessary for us to switch into another shuttle for the last 5 minutes….a process which took about 15 mins! It had just started to rain when we arrived, I was hungry (standard) and I wasn’t booked into stay anywhere. I had emailed the most popular hostel in town, Los Amigos, to try and reserve when I was in Antigua but the wifi drought in Semuc meant I hadn’t seen any reply. Lav and Jen had somewhere booked so I planned to try their place but when we arrived on Flores (an island in the middle of a lake connected to the mainland by a bridge) they were told that it was actually necessary to get a boat to get to the hostel. So I set off with Ana and LeAaron to try and get a room at Los Amigos. When we got there there was a big queue and we were told that it was 280Q ($40) for each private room. This is a lot steeper than most places in Guatemala, so we decided to try another place we’d seen with Lake views called El Mirador which turned out to only be 70Q ($10) a night for private room and bathroom. Amazing how somewhere just around the corner can be so much cheaper! We’d be warned about the ‘coyotes’ when you arrive in Flores: guys who promote certain accommodation and tours and take a cut. Two of these seemed to think they had shown us where the Mirador hotel was, despite the fact we’d noticed it earlier, and so they accompanied us back there. I dumped the rucksack of doom in the room, which itself was a bit cell like, no real windows and peeling wallpaper, but how picky can one be for $10 a night. I was so ready for my first hot (tepid) shower in a few days when suddenly all the power went out. You know when you fly into a giant childish tantrum over nothing? No? Maybe that’s just me! But that is what the power cut and consequent shower deprivation triggered. I stormed downstairs with my phone torch on, only to discover that the entire town was out which appeased me slightly. One of the coyotes was still loitering about trying to book us onto a tour of Tikal the next morning. He came over to chat to me and I think rapidly realised his error and backed away. I quickly snapped myself out of it and once I’d had a shower, dropped off my mounds of laundry and booked onto a (4.30am!!) tour for the next morning I was feeling FAR better. LeArron, Ana and I went to meet Lav and Jen in a fantastic little restaurant called El Terrazzo on the west side of the island. Walking there we realised that the entirety of Flores is about 500m in diameter, so whether you walk across it, or around Main Street that circles the island, everything is 5mins max away. The food at terrazzo was wonderful! the girls had delicious avocado salads, I was a fatty and had a goats cheese & pepperoni pizza and LeArron had a burger. It was one of those places where you’re torn between about 10 things on the menu, and happy hour cocktails were 10Q ($1.5), so £1!! Dangerous, although very small. We all woke bleary eyed super early the next morning. 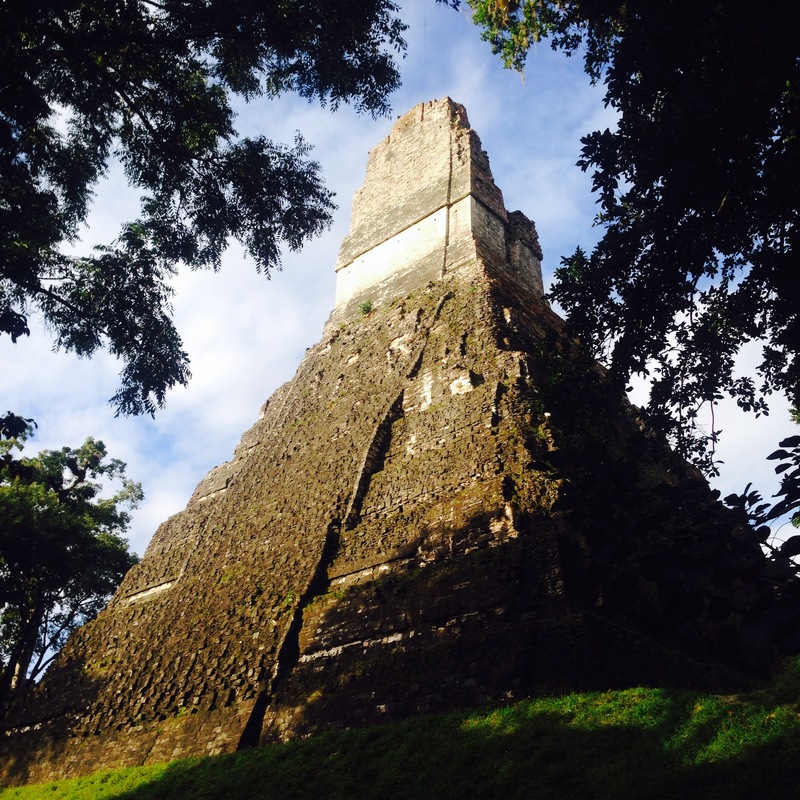 Tikal is a 1.5hr drive from Flores so our 4.30am start meant we’d arrive there at 6am, just in time to catch the sunrise if there was one. The real keen-beans get a 3am bus so that they can actually be up at the top of one of the temples when the sun rises. I’m very glad that we didn’t opt for that as the day we went there wasn’t really a sunrise, it just sort of got light without any wow moment! 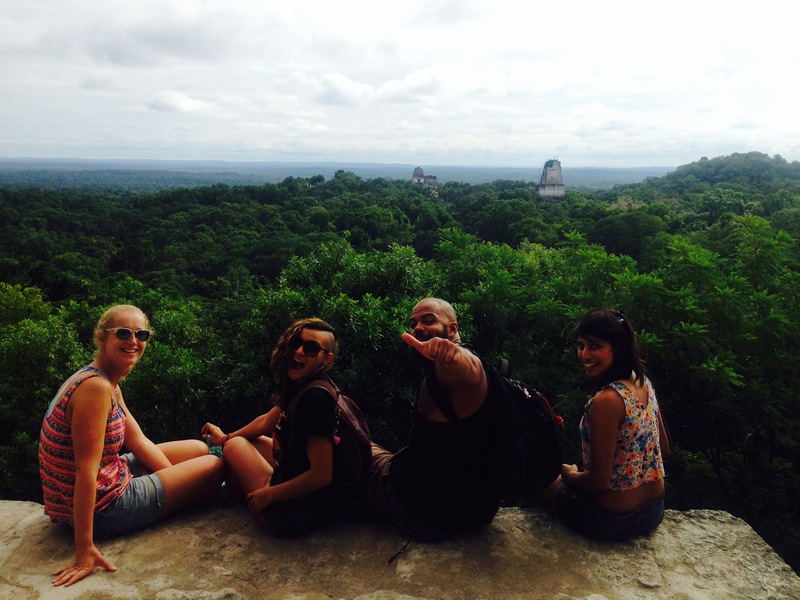 Tikal is incredible!! 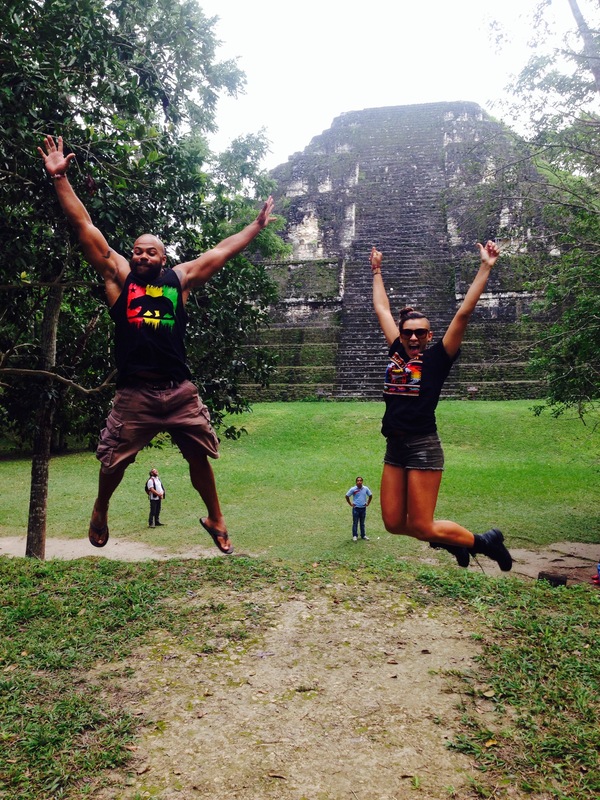 It’s a huge ancient Mayan site, and only 15% of the temples and pyramids are currently exposed. The rest are still totally buried under jungle growth. The drive from the entrance of the national park to the first temples is 16km…just to give you an idea of how much is still hidden!! The excavation and restoration works started in the 50s/60s and are ongoing, it’s going to look so amazing when even more is uncovered. I had imagined it far more exposed, like the photos I’ve seen of ruins in Mexico where there are huge stone plazas surrounded by the pyramids. In reality, it was made even more magical by the fact that you could be 50m from one of the towering pyramids but not realise that it was there because of the thick jungle growth! We opted for the guided tour and had an amusing guide called Luis. 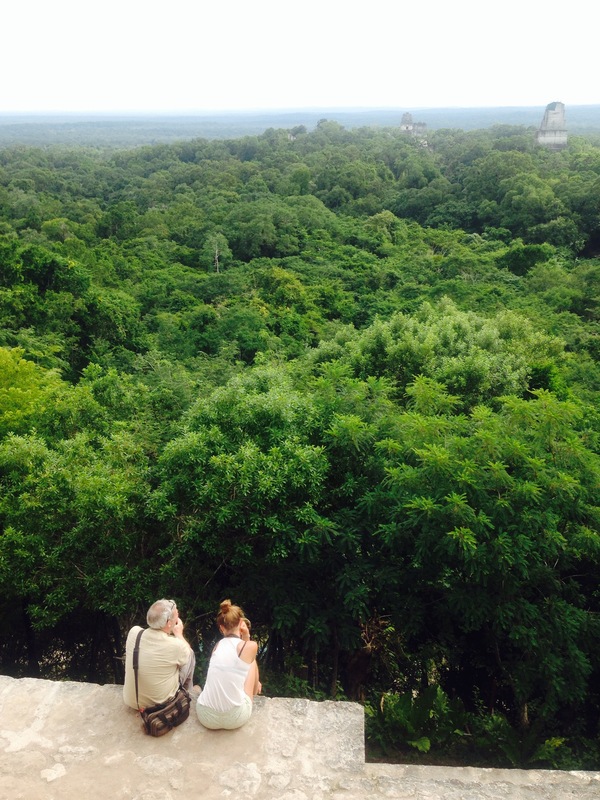 He had grown up in Tikal and was a keen birdwatcher. He showed us tucans, big guinea-pig relatives, spider monkeys, and we could also hear a howler monkey…it sounded so fierce!! I didn’t realise this but Luis said that the sound of howler monkeys was actually used for the t-Rex in Jurassic park. Another fun fact I will need to google. He had been to Tikal before and when he heard I was going told me all about his trip: how he was so overwhelmed when he entered the park that he “just walked around crying for 3 hours”, and that night he decided he didn’t want to leave so he “slept on the steps of one of the temples and the next day followed a group of spider monkeys and ate what they ate”. I tried my very best to give a polite and measured reaction to these statements. So in conclusion, I’d definitely recommend it, but no crying occurred on my trip. The only cash machine (I’m actually starting to say ATM…horror!) on Flores was broken so I had to don my newly laundered running gear and trusty money belt and jog over the bridge to Santa Elena where I had to try three different machines with my other card, I finally managed to get some cash but that card was then subsequently also blocked, resulting in another 50 minute call!! 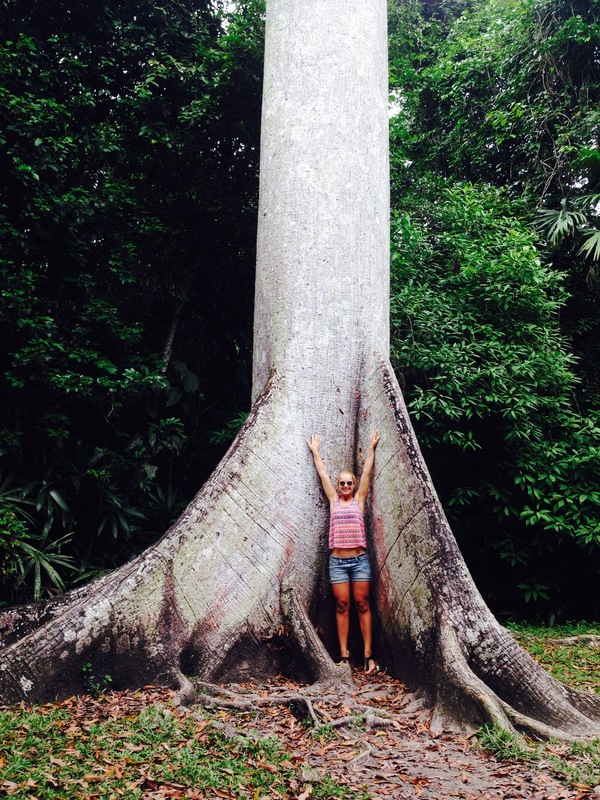 Sadly due to this cash dilemma I missed saying bye to Lav and Jen who were setting off that evening on an epic journey: Antigua – GC – fly to San Jose – travel overland to Bocas Del Toro Panama. LeAaron, Ana, Gerry and I went back to El Terrazzo that night for another delicious meal and said bye to everyone before we went our separate ways. It was another early start to fly back down to Antigua at 8am. I’d been told and read that the Flores – GC flight was often oversold and people regularly got bumped off it. 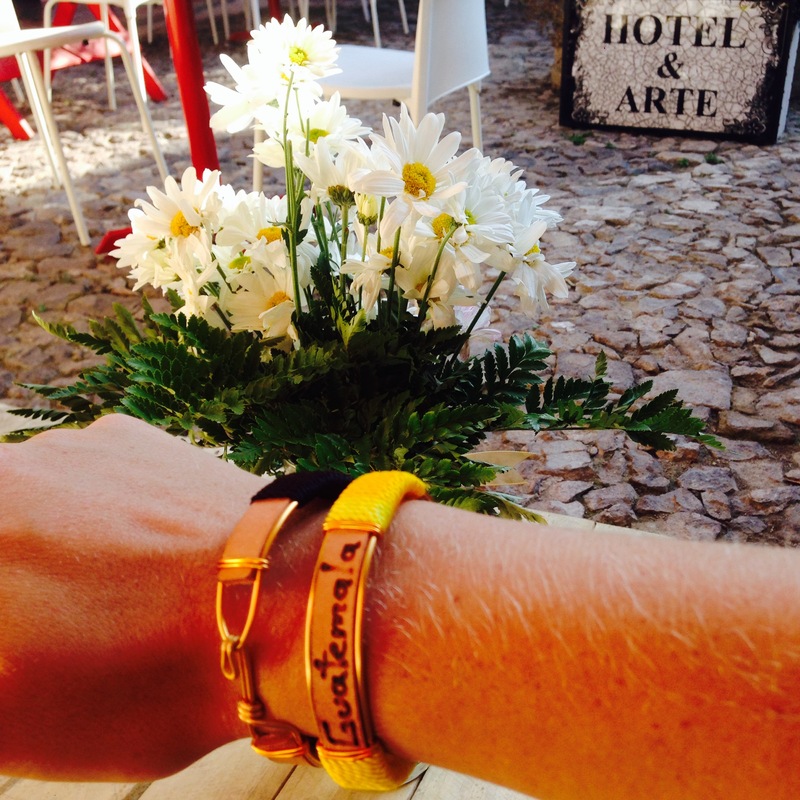 I couldn’t afford for this to happen as I had my flight to California out of Guatemala City the next day. I followed the recommendation and got to the airport 2 hours before, at 6am. I had organised for a TukTuk to come and collect me from the hotel at 5.45am and was panicking when he didn’t arrive and I had to flag one down on the street. I got to the airport just before 6am, and it was CLOSED! There was a man standing by the door who seemed baffled by why I was there, he asked if I was on the 7.30am flight and when I said “No, 8am” he laughed a bit and told me that my check-in wouldn’t be opening until at least 7am. He told me I could go around to the cafe, which was also closed. So I sat by myself outside the airport until it started coming to life. 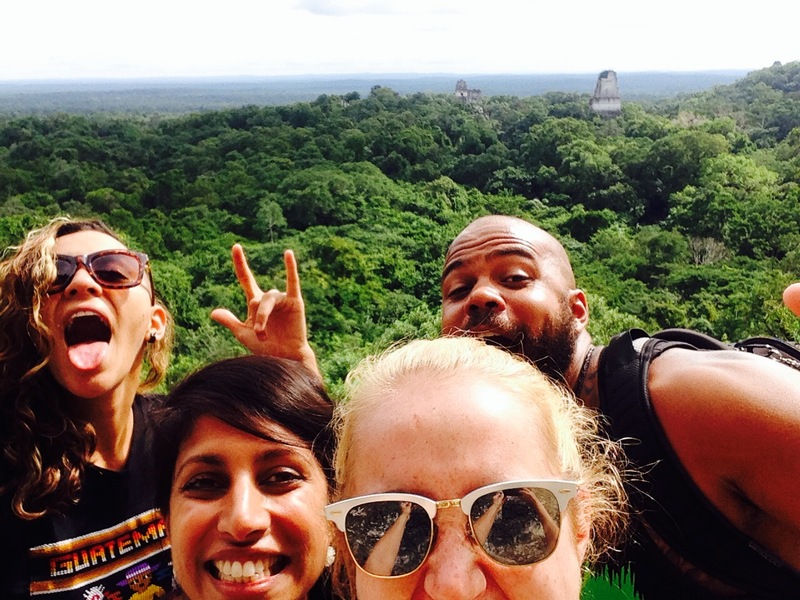 The only perk being that there was a spectacular sunrise – we definitely picked the wrong day to go to Tikal. In the end there were about 7 people on my flight. It said that it landed at the international airport in GC, what I didn’t realise was that it landed in the private terminal, meaning when we walked outside there were no shuttles to Antigua waiting as I’d been counting on, just a small empty car-park. I was in luck as there was a woman on my flight called Natalia who lived in Belize but was going to stay in Antigua for a couple of months. She had a car arranged to take her there so asked if I wanted a lift 🙂 so within an hour we were back in the centre of town. 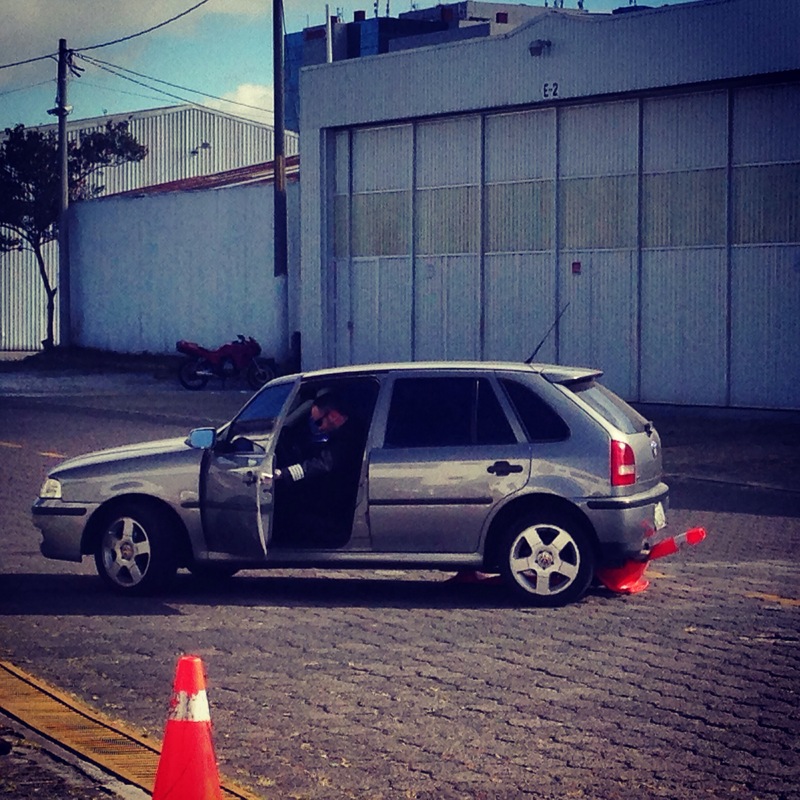 One very amusing incident as we were leaving the airport: the pilots left the terminal building as we were waiting in the car-park so we said “Gracias” and they hopped into their little car to drive off, only to promptly run over a 3ft tall cone in the car park, and then another one! There was this ridiculous situation where one got out to instruct and wave and the other was shuffling the car back and forth, unable to escape and gradually squishing the cones more. They could definitely tell that we were finding this hilarious, and when they’d finally freed themselves they looked over, Natalia asked them if flying a plane was easier, to which they sheepishly laughed and quickly drove off! That evening I met up with Michal and Ron, the Israeli couple from Semuc, for dinner and cocktails. Hotel y Arte was holding a poetry reading in memory of a friend of the owner’s father who had passed away 7 years ago. When I was in my room before dinner I could hear the reading going on in the courtyard, I could then hear everyone crying! I was in a bit of an awkward position as I needed to leave to go meet Ron and Michal but equally didn’t really want to disrupt the crying group! In the end I had to do it and just skulked around the back. 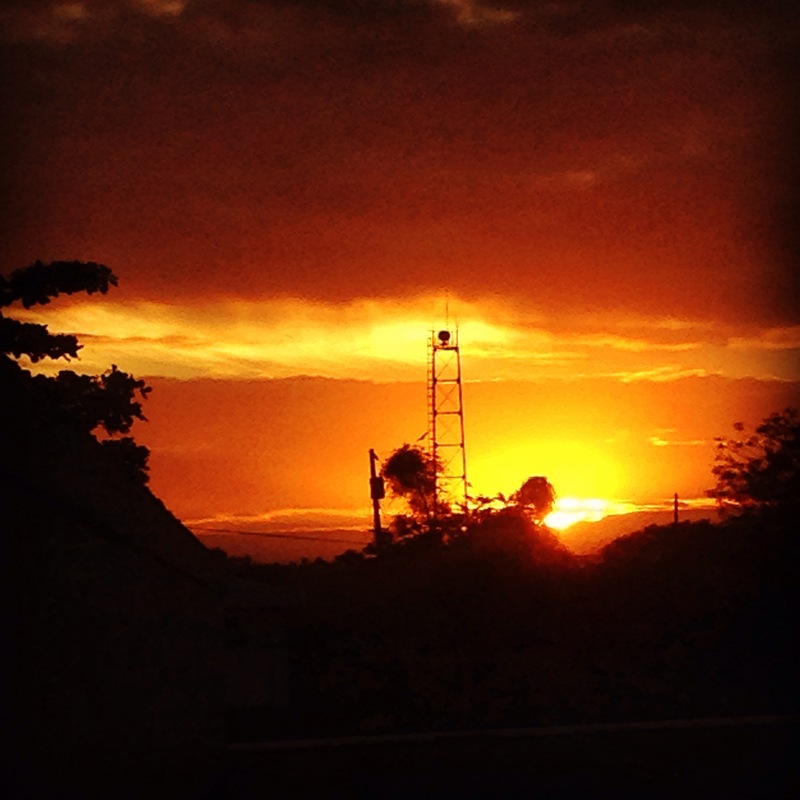 The next morning I waved goodbye to Antigua, and Central America, and heading to GC airport to fly to California for the next stage of the trip….praying I didn’t have the cone-gate pilots! !